LAKE PLACID — When Chadd Cassidy took over as the head coach of the Northwood School junior boys hockey team four years ago, one of his main objectives was to gear the program toward giving his players something to shoot for at the end of the season. 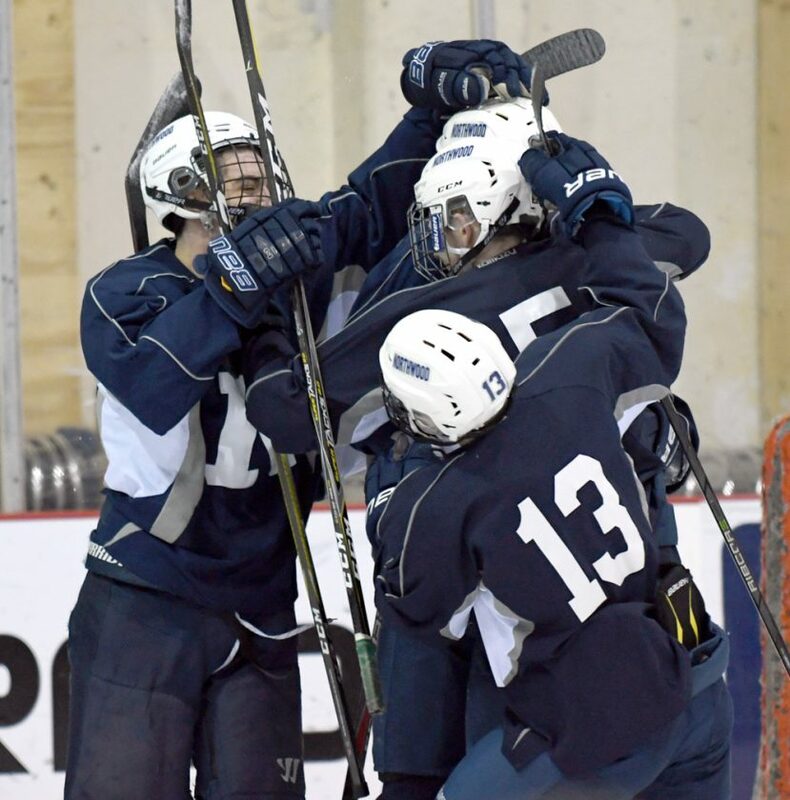 By cutting back the number of international players on the team and eliminating post-graduate age skaters from roster, the Northwood Huskies reset their focus toward earning a shot at competing for a national championship. Northwood’s juniors were finally able to take that route this season, and in their first year of eligibility, they are going to the USA Hockey Tier I U18 National Championship tournament. The Huskies punched their ticket to the nationals, taking place in Grand Rapids, Michigan April 3-8, by winning the New York state title two weekends ago in Buffalo. Northwood’s juniors went 5-0 and outscored their opponents by a combined 38-6 during their run to the school’s first-ever state championship. With a state crown and a 48-12-3 record in tow, the Huskies leave Lake Placid on Monday for Michigan, where they will be among 16 teams vying for a national title. Along with head coach Cassidy and assistant Trevor Gilligan, Northwood’s players will board a bus for the 11-hour ride to Grand Rapids. They will play three opening-round games, and if they fare well enough in those encounters, they’ll advance into quarterfinal action. And once teams reach the playoff round, it’s win and move on or lose and go home. Prior to this season, the big prizes for the Huskies during a hockey season was to finish on top of their league and capture titles in prestigious tournaments, which always included their own Northwood Invitational each January on home ice at the Olympic Center. “Our schedule since I’ve been here has always been really strong, but we kind of never had that thing to play for at the end of the year,” Cassidy said following a spirited team practice on Wednesday. “We had a league championship, we just played a bunch of independent exhibition games. They were all quality games, but it didn’t give us anything to build up to. So this year, we had the ability to build up to our state tournament, which we recently won in Buffalo, and if you did well there, you move on to nationals, and that’s certainly something our players were playing for. Before taking over the Northwood program, Cassidy was the head coach of the AHL’s Rochester Americans. At the time, Northwood’s junior team had upwards of a dozen skaters hailing from countries outside of the United States. The team also had post-graduate players who would be too old to compete at the age level at which the junior squad is currently participating in. The junior roster Northwood is taking to Michigan features two Canadians, a British player, one student-athlete from Finland and the rest Americans. Six members of the squad have made commitments to play for NCAA Division I colleges. Cody Monds and Matt Shanklin are seniors playing in their final season at Northwood. The two forwards said they are thrilled to be competing in the national championships, which will be the final time they play in a Huskies hockey jersey. Hailing from Brockville, Ontario, Monds is one of the four international skaters on the team, and leads the Huskies in scoring with 37 goals, 53 assists and 87 points in 62 games played this season. Shanklin, a center from Cleveland, said it’s already been a memorable season being part of a team that made history at Northwood. “It’s been a heck of a ride this year,” Shanklin said. “Getting that first state title in school history is something that I think the guys will remember for the rest of their lives, and we have six more games to win out and I think we have a good chance to do it. As long as we play our game, it should be a good week for us. The Huskies enter the U18 national tournament as the ninth seed, and Cassidy said that placement may have given his players some added inspiration. Northwood’s opening group of four includes the tournament’s top seed as well as the lowest. The Huskies begin play Wednesday, April 3 against Victory Honda, the No. 8 seed. On April 4, the Huskies skate in a showdown against No. 1 seed Shattuck St. Mary’s, and then take on the 16th-seeded Sioux Falls the following day. Cassidy said posting a 2-1 record against those three opponents should be a good enough effort to move into the quarterfinals, but obviously the Huskies would love to get through the preliminary round unscathed. “We’ve played Shattuck, which is the No. 1 team going in,” Cassidy said. “We lost in overtime in January, and they beat us up pretty good in mid-February. We know how good how they are, but we also know that we can beat them. We beat them last year.